It's good to see that the Singstar series is still as strong as ever on the PlayStation 2 and best of all, the latest incarnation of the series is also compatible with the powerful PS3. 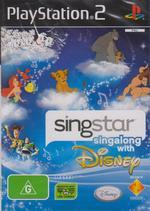 With that said, Singstar Singalong with Disney features some classic Disney songs from Aladdin to The Lion King that will have younger gamers clamoring for more. 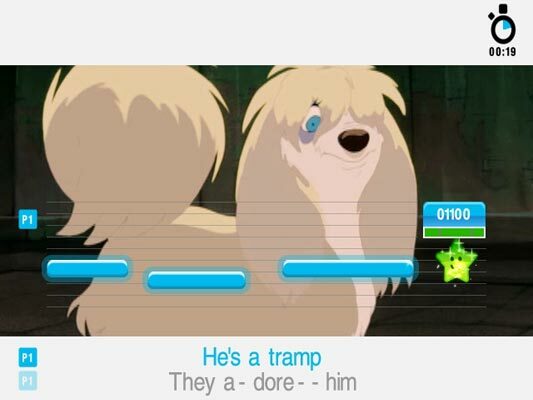 The biggest change to Singstar Singalong with Disney compared to other Singstar games is the simplified and "kid" friendly menu system that is not only easy to navigate but features a plethora of cartoon inspired colours and Disney themes. Featuring a bevy of popular Disney characters, children will simply adore the songs included in this compilation and even some adults will also enjoy the experience. Gameplay wise, the title is reminiscent of previous Singstar games that include modes such as Solo, Battle, Pass the Mic and Duet. For those unaware of the Singstar franchise, gamers must sing the words to the music and they are awarded points for how well they have sung. Even though you can hum your way through the game, to really excel, you need to sing. When it comes to sings, the title contains some classics that include Aladdin "A Whole New World", The Jungle Book "The Bare Necessities", Toy Story "You Got A Friend In Me" and for the younger player, The Little Mermaid "Under The Sea". The songs are quite varied and are not just limited to one era of Disney which is quite an impressive variety. The only downside to the game is that it only contains 20 tracks, unlike the standard 30 tracks that generally come with new Singstar games. 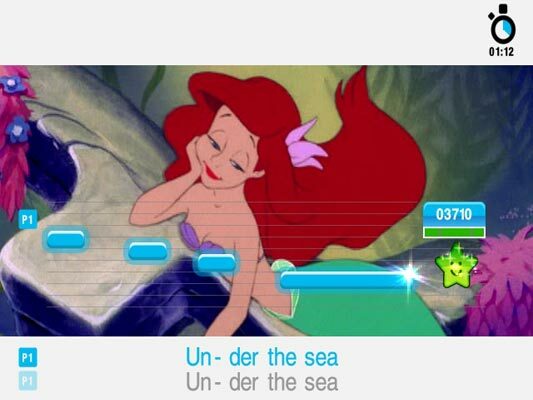 Ironically, the songs are quite complex in Singstar Singalong with Disney and some are quite fast, however I was quite impressed seeing my six-year old niece keep up with the pace. Fortunately the words are displayed on the screen for gamers who need assistance with the words... like myself for instance. 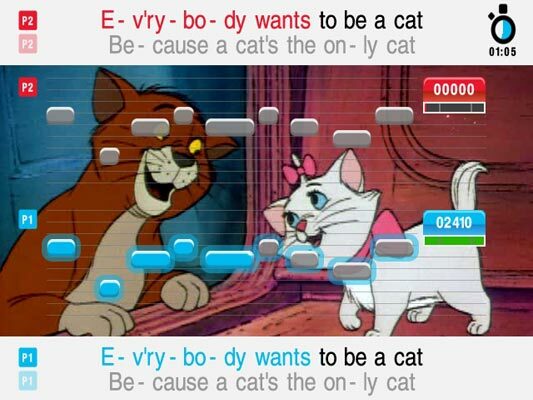 Graphically, the title is rather Spartan and uses images and videos from the Disney films to assist in the presentation, however at the end of the day, it's just the Singstar engine slightly modified. Where the game does excel is through the music, however as there are 10 tracks missing, the game does lose a few points in this aspect. In conclusion, Singstar Singalong with Disney is an entertaining change and premise to the franchise that most younger games will simply adore. Even older gamers may get a kick when they use it for a party game, however if you're a fan of Disney music, than this is a must have! • Peter Pan Following The Leader and You Can Fly!